Why You Need to Know The Anatomy of Your Garage Door | McKee-Horrigan Inc. Pieces & Parts: How Exactly Does Your Garage Door Work? There’s a reason that we love Friday afternoons so much – the vast majority of adults are off work for the week and can enjoy a few days of freedom. There’s even a phrase: TGIF, Thank God It’s Friday! A little rest and relaxation on the weekend prepares us for the next week, and we can pursue our interests and have a good time. Now, imagine that you didn’t have a weekend, or any breaks at all. Your job is 24/7, and you need to be ready at all times in case someone needs you. Does this existence sound dire? Then you should be extra sure to appreciate your garage doors! Mississauga homeowners often commute to work, take the kids to hobbies, take care of daily chores, visit relatives and friends, or pick up friends and families for a ride. Needless to say, your garage door does a lot of work to allow you to come and go as you please. In fact, the average garage door opens and closes 1,500 times in a year! If you don’t find that impressive, be sure to remember that there are only 365 days in a year. How exactly does your garage door pull this off? And why do these resilient doors sometimes fail? In order to answer these questions, we need to look at the chorus of complex parts that work together in unison each and every day. Here’s an “inside look” at your garage door, and what you need to know about each part. 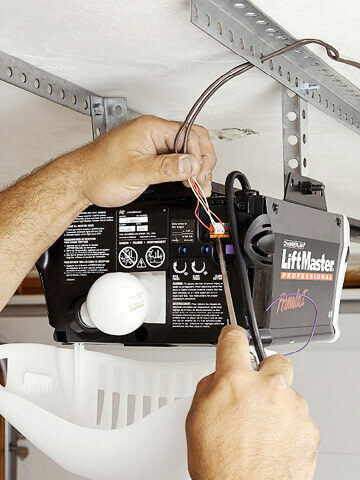 The mounting hardware are the metal frames attached to your ceiling that hold the garage door together as a structure. These pieces of hardware are some of the most resilient parts of the door, and you will rarely (if ever) hear stories of the hardware failing unless there is some sudden external trauma caused by something like a car collision. Of course, homeowners want to be sure that the hardware is tended to. Your responsibilities include making sure that rust and dust aren’t gathering on the brackets, which is fairly simple. Something a little more complex is ensuring that there are no critters such as bats trying to make a home there. If that’s the case, call in some animal care experts to get your new fuzzy roommates to a better home. The mounting hardware is attached to our next system, the torsion spring. The torsion spring is a counterbalance system that is one, sometimes two depending on the model, tightly wound up spring(s). These springs are on a steel shaft that has a cable drum on both ends. The torsion spring is mounted above your garage doors and is carefully supported. If the mounting hardware is the skeleton of the system, then the torsion spring is the heart. Every time the door opens, the springs unwind and the stored tension provides the energy to lift the door. When the door is lowered, the cables unwind from the drums and the spring is restored to full tension. A torsion spring is guaranteed to last for three to seven years, depending on the manufacturing, and there is a set amount of ‘cycles’ they can endure. This lifespan can range from 10,000 uses to 30,000 uses. Make sure to have your torsion spring checked and replaced at the end of its lifespan, as a broken one can be dangerous due to the stored tension. Furthermore, if you change the weight of your garage door through extra insulation or glass installments, have experts change your tension spring so it matches the new weight. The torsion spring is connected to this team of helpful parts. While the torsion spring provides the energy for your garage doors to open and shut, the pulley and cable help pull the door open or draw it closed, and the track ensures that it all goes along the right path. The belt helps run the system along smoothly by pulling the mechanism along its rubber, nubby teeth. These systems are fairly simple and therefore tend to last longer than most parts of the garage door, but you should still ensure you keep an eye on any signs of dysfunction, as they are essential for the rest of the system to run smoothly. These systems know when to operate thanks to our next guest, the operator. The above systems can be compared to a skeleton, limbs, or a heart, but the operator is something very essential: the brain. The operator is the electrical and mechanical system that controls your garage door opening and closing, as well as moderating the door’s speed to avoid a sudden crash. We’ve written before about how to keep your operator running, but this little piece of tech is generally very reliable. Of course, it isn’t the only piece of tech attached to your garage door. Are your garage doors reaching the end of their lifespan, or do you need a specific part repaired? Call us today at McKee-Horrigan Inc. for a free quote and a discussion about the job at 1 888 244 4171. For more information on our residential doors, check out our blog for a discussion on many different facets of homeownership and garage door repair.